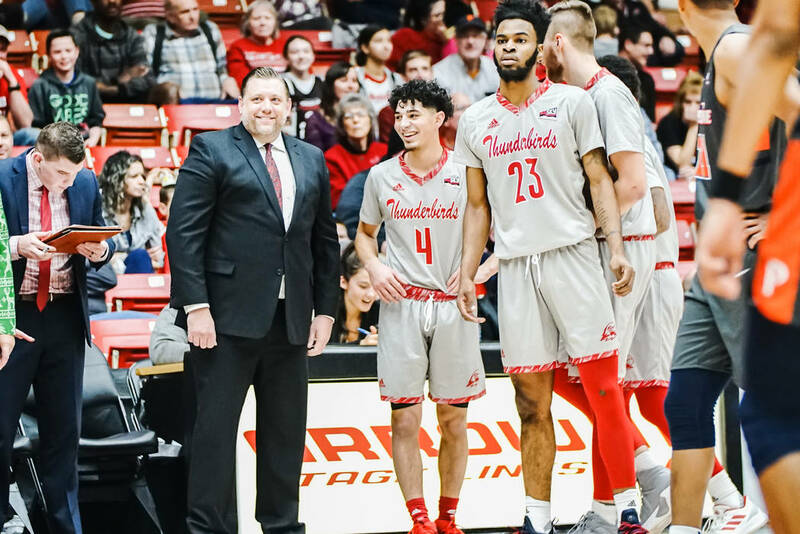 Former UNLV assistant coach Todd Simon has guided Southern Utah to just its second postseason appearance in 31 years as an NCAA Division I member. Former UNLV assistant coach Todd Simon has guided Southern Utah to its second postseason appearance in 31 seasons as a Division I member. The Thunderbirds will host Missouri Valley Conference co-champion Drake in the first round of the College Insiders.com Tournament on Friday night. (Courtesy: Southern Utah athletic department). Sometimes in the Big Chill — aka Big Sky — Conference, it’s not about surviving and advancing during the postseason. It’s more about surviving a Montana road trip during the regular season, says Todd Simon, the former UNLV assistant in his third year as coach at Southern Utah. Any advancing beyond that is considered a bonus. “There’s no league like the Big Sky when it comes to travel,” Simon said. “We go to Montana State, it was minus 25 — not wind chill, on the thermometer. I’m from Michigan, I’ve been in the cold. But we walked out in that minus 25 and said ‘What is this ?’ Our plane — 4 a.m. wakeup call — almost didn’t leave” because it was too cold to de-ice. The Thunderbirds pulled off a rare Big Sky double. Not only did they survive an expedition to Ice Station Zebra during sled dog season, they earned a postseason bid. An upset of second-seeded Northern Colorado in the conference tournament along with 15 other wins netted Simon’s team a Friday home game in the College Insiders.com Tournament against Drake, co-champs of the Missouri Valley Conference. It’s just the second time in 31 Division I seasons that Southern Utah has advanced to the postseason. The other was 2001, when the T-Birds lost 68-65 to Boston College in the NCAA East Regional. So this is a pretty big deal up in Cedar City, especially when one considers how far Southern Utah has come in such a short time under Simon. The T-Birds went 6-27 in his first year. Late in the season, when he learned visitors from Las Vegas has made the trip up Interstate 15 for the Northern Arizona game, they were invited into the dressing room for the pregame pep talk. Southern Utah won. No, the visitors from Las Vegas were not interested in making the Montana road trip. “I had to do a little more inspiring back then. We were 350 out of 351 when we took it over,” Simon, 38, said of the unlimited access and Southern Utah’s national ranking. The Thunderbirds were better his second season and finished 13-19. This year they are 16-16, which in the Big Sky translates to more like 21-11, if one discounts “buy” games. Not bye. Buy. To meet budgetary needs, teams from lower mid-major conferences must schedule road games against superior opponents in return for a paycheck. Southern Utah won two such games, beating San Jose State and Seattle. Simon’s team also played UNLV to a 76-71 loss at the Thomas & Mack Center. “The win percentage on those games is 4.9 percent,” said Simon, who spent 12 seasons in Las Vegas, sandwiching coaching duties at Findlay Prep around two stints as a UNLV assistant. When Dave Rice was fired midway through the 2015-16 season, Simon guided the Rebels to a 9-8 record as interim coach. This year they were pretty good. Next year Simon says they should be much better. Dwayne Morgan, a former UNLV star recruit, and point guard Jason Richardson were limited to a handful of games by season-ending injuries. When healthy they will be joined by Iowa State transfer Jakolby Long and the usual assortment of other transfers and tall guys Simon finds overseas. “We got ‘em from all over,” he said of a hodgepodge roster that lists players from Georgia — the republic and the state — Senegal, Croatia, Alaska, Cal State Northridge, Iowa State, Illinois State, Utah State, Boise State, Arizona State and two from Las Vegas, seniors Elijah Graves (Liberty High) and Matthew Johnson (Coronado) who saw limited minutes off the bench. So it would appear getting out of the Big Chill and back into the NCAA Tournament is a realistic goal for Todd Simon and Southern Utah. It was a cold day in Bozeman the last time anybody could say that. 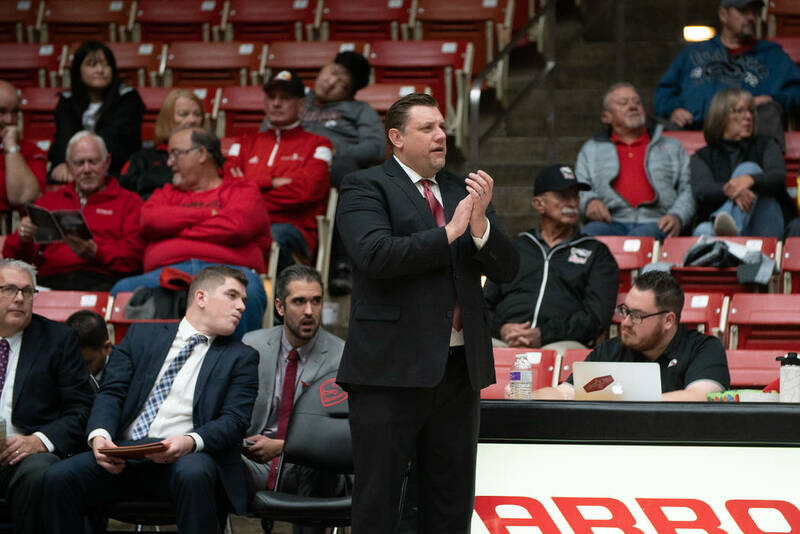 Former UNLV assistant and interim head coach Todd Simon has taken Southern Utah from the basketball doldrums to a postseason berth in just three seasons. *Southern Utah will host Missouri Valley Conference co-champion Drake in the College Insiders.com Tournament first round.